"The 50 Mighty Openings" explained! 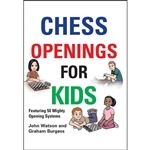 This book teaches the names & starting moves of all the main chess openings, and explains the basic ideas. Beginners will learn how to position their pieces for maximum impact. More experienced players will discover some remarkable tactical & strategic themes that are vital for chess mastery. Throughout the book, numerous devestating opening traps are highlighted. You will have fun posing difficult problems for your opponent--whether a friend, a chess club rival, or your Dad! CHESS OPENINGS FOR KIDS makes learning the chess openings fun. Playing these powerful openings helps develop an understanding of how the pieces work together. Soon you will be able to play strong moves in any opening position, and approach every game with confidence--and success!